This was never going to be an easy game. Brighton are a very strong, well established team. Playing them at home was hard enough and we fought hard for that draw, but playing them away we were expecting a real challenge. The game started very even, both teams having good spells of possession but then Brighton began to get on top of the game in terms of chances and possession. We defended extremely well and went in to the break 0-0. Looking back at the first half we lacked the attacking threat when on the ball. But what we lacked in attack we made up for in defence. 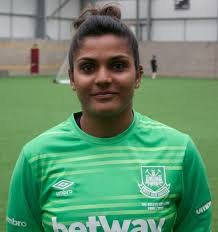 Some solid saves from Aditi and lots of fending off from the back four. The second half continued where the first half finished, with Brighton on top with the lion’s share of possession. We battled on, defending well, but there was a brief lapse of concentration which saw Brighton take a lead from probably the softest goal we have even conceded. The girls must have really felt a sense of disappointed from this goal as all of their relentless defending was undone in one foul swoop. The girls dug in deep, three substitutions were made and then we were hit with two injuries which left us with 9 players for the rest of the match. Those 9 left on the pitch worked tirelessly to prevent any further goals for the remaining 15 minutes. Full credit to the girls who staved off any further goals and we take the positives from this as well as the negatives. We now face Plymouth this weekend.